12 & 0!! What a game! Brad and the kids and I went up to Brad's parents house to watch the game since we do not have the Mountain with Dish network. We were on the edge of our seats till about the 5th interception and then we were able to relax. Brad and I were yelling at the TV screen and Addison would look at us like we were half nuts. Jackson would shout 'GO UTES!' when Brad and I would freak out and then go back to playing with whatever he was playing with at the time. 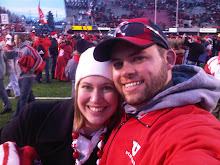 We are so excited and happy about the Utes victory. Good game to the 'Team Down South'. BCS Bowl Game here we come!! Call me crazy, but yes I was one of those crazed Twilight fans that went and saw the movie at 12:01 a.m. Thursday night/Friday morning. I was initially going to go with my sisters, but that didn't work out so I was lucky enough to get a ticket from a friend who was going to be out of town that was going with the girls in our book club. Thursday morning a bunch of us got together and went to Old Navy to buy pajamas to wear to the movie. Later on we all went to have dinner/breakfast at Jim's and then after we went to the movie. The movie theatre was crammed with people and there were even two guys dressed as Edward and I think Jasper or Carlisle. We saw lots of different shirts with different Twilight sayings. I loved the movie!!! I thought they did a good job of keeping to the book and not putting the Hollywood spin on it. When watching the trailers for the past several months I was not impressed with the actors and actresses they chose for the characters, especially Edward, but after seeing the movie I do not think they could have casted any better, especially Edward. Great movie!!! Anyone up for seconds?? My friend has this posted on her blog and I wanted to find out who I was? I took the test and I am a Bella. "You are observant, diplomatic and often aim to please. You are unaware of your attractiveness and despite being uncomfortable with any form of attention, people enjoy your company. You can be impatient, stubborn and headstrong, but you are true to your word and mature for your age, often taking care of your family and enjoying a good book over chatting with girlfriends on the phone." Take the quiz and find out who you are. I took the quiz a second time because there were a couple questions that I could have had two answers for and the second time I was an Esme. Anyway, have fun with it. WOW!! Eight months, where does it go?? Addison is getting so big and has learned so many new things. We have reached the point over the last few months where I feel we can say "Life is Good!" Addison is so happy and content which has made things wonderful. As far as her acid reflux, she is no longer on prescription medications. She takes an over-the-counter antacid called Gaviscon 2-3 times a day and that has seemed to do the trick. Yeah! She is also off the special formula (Nutramigen) for the milk protein intolerance and is now on a mixture of soy formula and regular formula. She is doing great! I am so glad we were able to see the GI specialist, she helped us get Addison off the three medications and back on regular formula, but most importantly, she helped us have a happier Addison. Dr. Harnesberger is an angel on earth! Addison was able to have her first biter biscuit the other day and she loved it. Can you tell? Addison is into everything! She is always going and is a handful. A little bit ago she was playing with a sign on the entertainment center and I told her "No no Addison" and pulled her away from it and walked away. Well she wormed her way back to it and started playing with it again. I went over to her told her no, no and pulled her away. Well, the third time I pulled her away from it, slapped her hand and told her no, no. As I walked away I turned and saw her look at Jackson and get this big grin on her face. Since then she has had her hand slapped quite frequently and told no, no, but it doesn't seem to do us any good. Within the last few days Brad and I think that she is finally understanding no, no because she cries whenever she gets a slap on the hand and told no, no. Let me tell you we are not looking forward to the Christmas tree! Addison has learned a few new things. She has learned to crawl. At first it started with worming her way everywhere and now she actually crawls on all fours. She will be in one room one minute and then in another room the next. She loves being mobile and following Jackson wherever he goes. She has also learned to pull herself up on things, but she gets really frustrated when she can't figure out how to get herself down. She really keeps us on our toes. Addison's biggest accomplishment (at least to me) over the last few months is her first tooth. We were told by our pediatrician at Addison's four month well child check that she could see Addison's teeth on the bottom and that she would be an early teether. Well, four and a half months later and here we are. Last week we had a few days where she was really clingy to me during the day and slightly fussy, but really drooly. I looked in her mouth on Wednesday and saw what looked like a canker on her gums. When I looked on Thursday the spot was bigger and I could feel that the gum had broke and the tooth was waiting to move up further. Today we could feel the sharp little tooth. Yeah!! When I look back a year ago and was approaching my last trimester, it amazes me how fast things go. Since Brad and I have difficult newborns I tend to find myself wishing for them to be 3 months old and then waiting impatiently for them to be six months and so on, but then as I look back I think why was a wishing that time away? I love the stage that Addison is at and I wish that I could keep her at this stage. She is such a joy in our lives and brings us so much happiness. We are truly blessed! !